In the central atrium of the Museum für Naturkunde, fossils of plants and animals from the late Jurassic are on display. Many of the exhibits were brought here from one of the most significant palaeontological expeditions to Tendaguru Hill in what is now Tanzania. Between 1909 and 1913, scientists of the Museum, led by palaeontologist Werner E. M. Janensch (1878-1969), found approximately 230 tonnes of bones – the most successful dinosaur excavation of all time. To this day, much of the Museum’s research has been focusing on these finds. The dinosaur skeletons from Tendaguru are complemented by plants and animals from other fossil sites, such as the world-famous Solnhofen limestone. 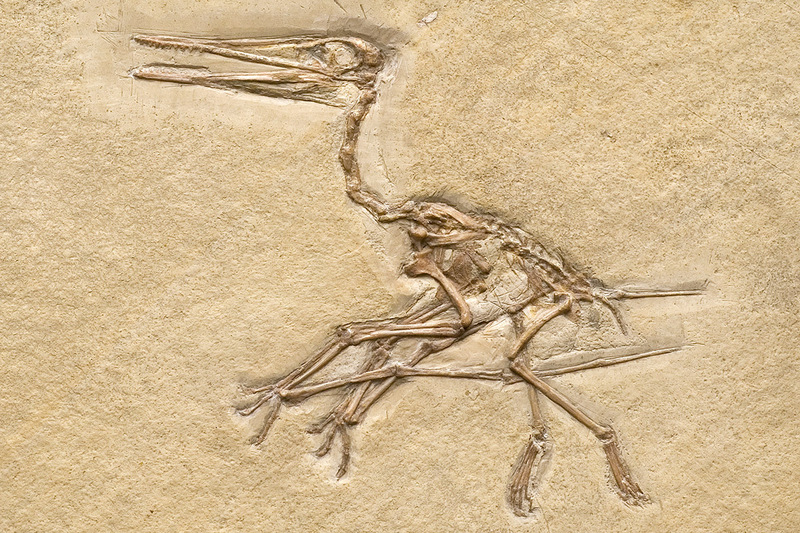 The original Berlin specimen of the primaeval bird Archaeopteryx lithographica is a particular highlight. It is displayed in a state-of-the-art security display cabinet that provides an ideal environment to preserve the fossil as well as allowing scientists to study it. Interactive telescopes, called Jurascopes, show visitors in a step-by-step animation how the original skeletons in the exhibition turn into live animals. Please note: In the dinosaur exhibitions realistic animated films with hunting scenes among dinosaurs are screened, which might terrify children. Brachiosaurus brancai stands 13.27 metres tall and is the tallest mounted dinosaur skeleton in the world, as the Guinness Book of Records confirms. 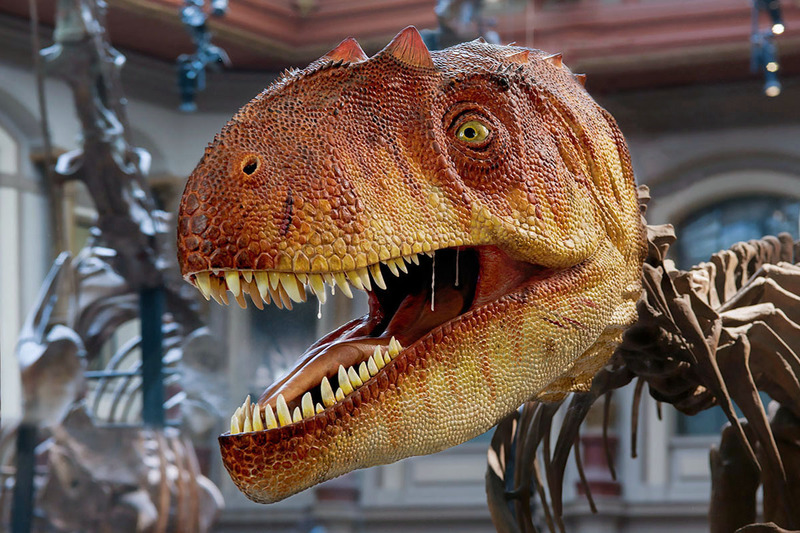 The dinosaur lived 150 million years ago and fed on plants. Its skeleton was found by researchers during the great Tendaguru expedition. The name Brachiosaurus – lizard with arms – refers to its long arms. In 2007, visitors gave it its official nickname, Oskar. Scientists all over the world are puzzling how much a live Brachiosaurus actually weighed. Some have calculated a mass of 50 tonnes, whereas others think it was just 20 to 30 tonnes. Furthermore, they are interested in the static and physiological problems a dinosaur this size had to overcome. A new scientific name was given to Brachiosaurus in 2009, when differences in the shape, size and proportions of the bones led to the distinction between a North American and an African Brachiosaurus genus. Thus, Brachiosaurus brancai became Giraffatitan brancai. This is now the scientifically recognised name used by researchers. 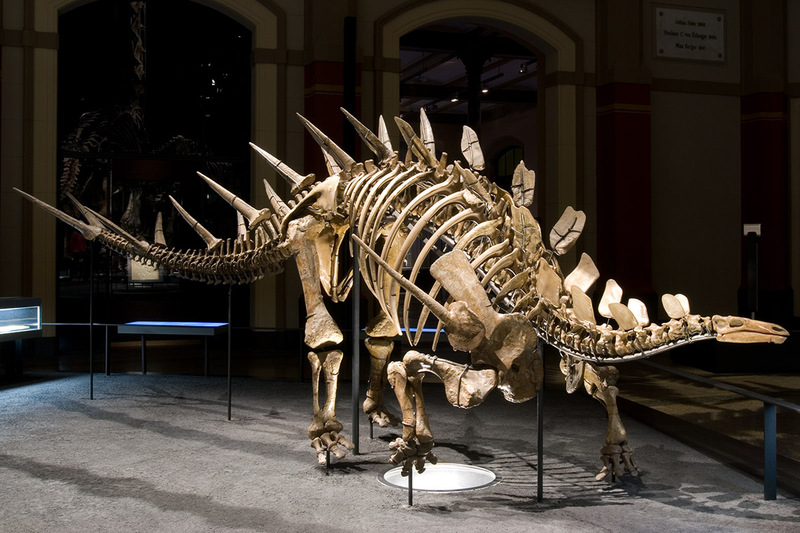 Kentrosaurus aethiopicus is a member of the Stegosaurus group. They lived in the Upper Jurassic 161 to 145 million years ago and were plant-eaters. Like Brachiosaurus, the fossils of Kentrosaurus were excavated at Tendaguru Hill. The hallmark of this dinosaur are the paired spines along its back and tail. The neck and chest are covered with bony plates. It is as yet unclear what function these bony structures had –the spines could have been defensive weapons or served some communication purposes. They could also have made an impressive display during the mating ritual. It is also thought that the bony plates might have helped to regulate body temperature. Allosaurus fragilis is a member of the Theropoda dinosaurs. 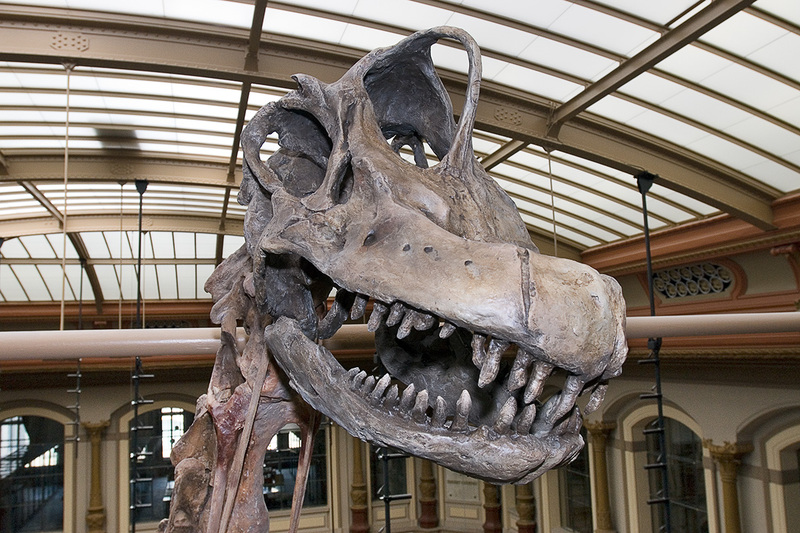 These include among others Tyrannosaurus rex, who lived in the Cretaceous period. During the Upper Jurassic, Allosaurs were the biggest carnivores. Their light body and strong masticating muscles indicate that they were active hunters. They seized their prey with their sharp claws and then tore it up with their blade-like teeth. As the Tendaguru expedition merely yielded a few bones of the animal, our Allosaurus in the exhibition is a cast. Theropoda are now thought to be the direct ancestors of birds. Their common anatomical features include hollow spaces in their vertebrae, their S-shaped necks, bipedalism (walking on two legs), and the structure of their egg shells. Feathers, one of the main characteristics of birds, evolved during the evolution of predatory dinosaurs. The forelimbs became longer and adapted to flight, the pubic ramus began to curve backwards and the shoulder blade became long and narrow and curved backwards. Other bird characteristics evolved. Pterosaurs (winged lizards) dominated the airspace in the Mesozoic era from 200 to 65 million years ago. The short-tailed pterosaurs (Pterodactyloidea) were the first actively flying vertebrates. During the Jurassic, pterosaurs were rather small, whereas later, during the Cretaceous period, they became enormous with wingspans of up to 11 metres. It has been verified that pterosaurs laid eggs. The young were probably able to fly immediately after hatching. The fossils shown in the exhibition were found in England, Bavaria and at Tendaguru Hill. 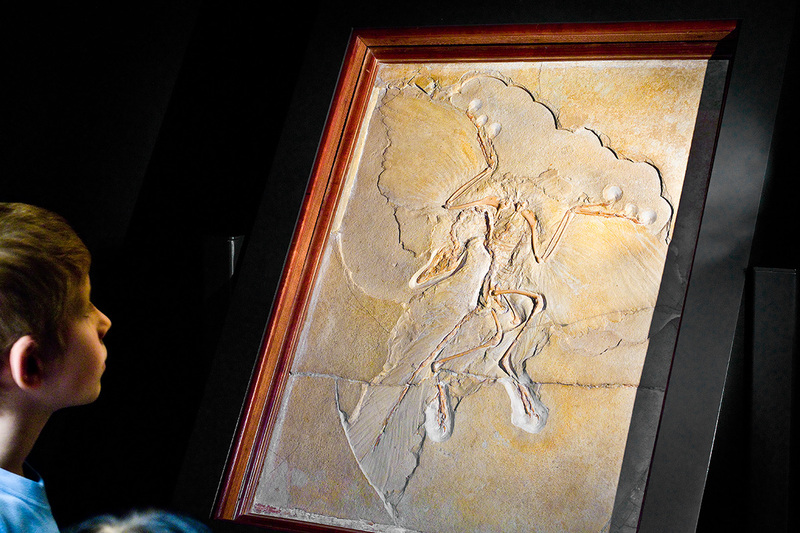 The Berlin specimen of the primeval bird Archaeopteryx lithographica is thought to be the best-known fossil in the world. It is about 150 million years old and was found in limestone deposits on the Blumenberg near Eichstätt/Bavaria in 1875. Archaeopteryx shows traits of both reptiles and birds. The reptile characteristics include the bony tail, the teeth, and claws on its wings. Feathers, wishbone and brain resemble those of birds. This makes Archaeopteryx an important piece of evidence for the evolutionary principles developed by Charles Darwin. The theory of evolution postulates that when new groups evolve, there must be transitional stages featuring characteristics of the old as well as the new group. At Tendaguru, explorers found not only dinosaurs, but also other fossilised animals and plants. The presence of marine fossils suggest that on the foreshore of what is now the Tanzanian coast, there were mud flats and lagoons, sheltered from the open sea by reefs, but allowing a constant exchange of water with the open sea. Such reefs were mainly aggregations of thick-shelled oysters. Bivalves, snails, corals, sea urchins, fish and crabs were found. Such seemingly inconspicuous finds hold important information for research about habitats 150 years ago. 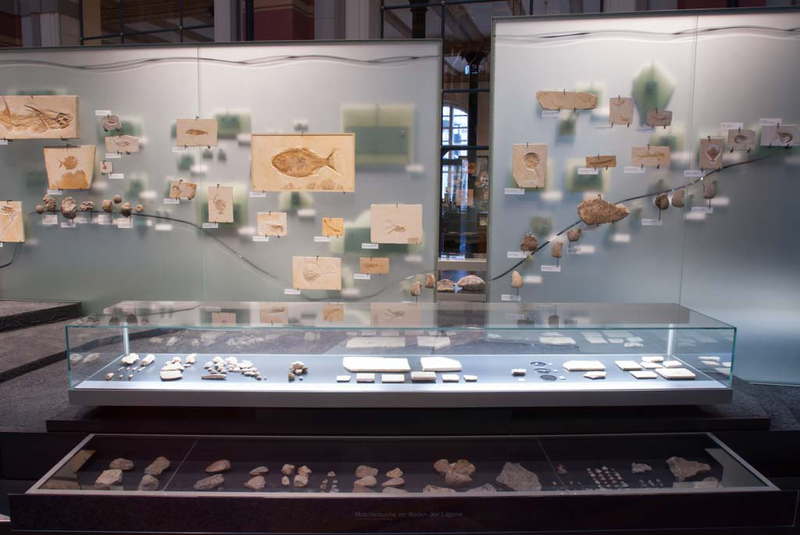 Three glass walls display fossils from the Tendaguru, Eichstätt and Solnhofen sites.